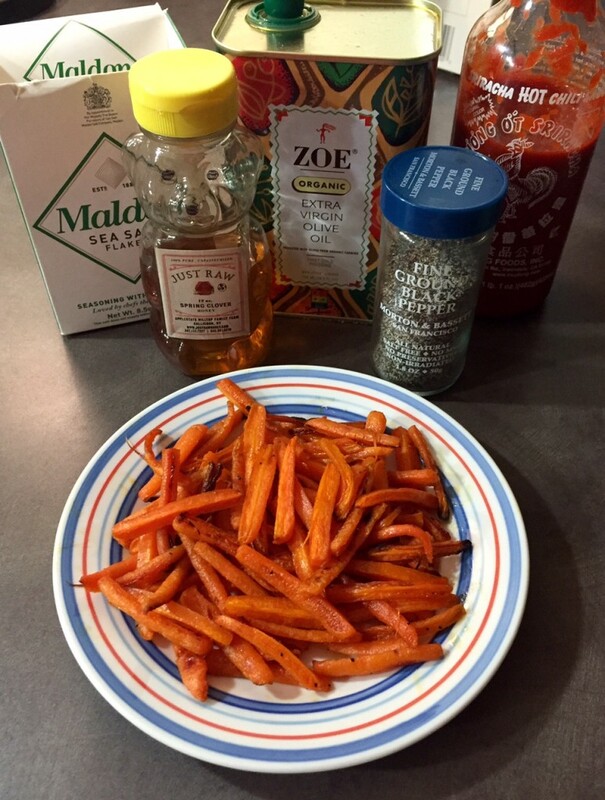 This recipe for carrots roasted with honey and Sriracha is incredibly easy to make. I think roasting vegetables brings out their best flavor and this recipe can easily be adapted for all different kinds of vegetables. It could work with green beans, asparagus, broccoli or even butternut squash. These carrots are also delicious leftover in salad! Preheat oven to 435 degrees. Trim carrots and cut into thin slices. Mix together olive oil, honey, and Sriracha in a bowl. Add in carrots, rosemary, salt, and pepper. Toss so that the carrots are evenly coated. Heat an ungreased cookie sheet in the oven for 5 minutes. This will make the carrots nice and crisp. After 5 minutes, lay the carrots flat on the heated pan. Bake until tender, about 20 minutes, turning halfway through.